First, a Halloween meme that made me laugh. Happy Halloween! Now, I’ve written before about my family’s favorite Indian restaurant, Mt. Everest, in Evanston, Illinois. Most of the Indian dishes I cook at home are my own varyingly-successful attempts at recreating our Mt. 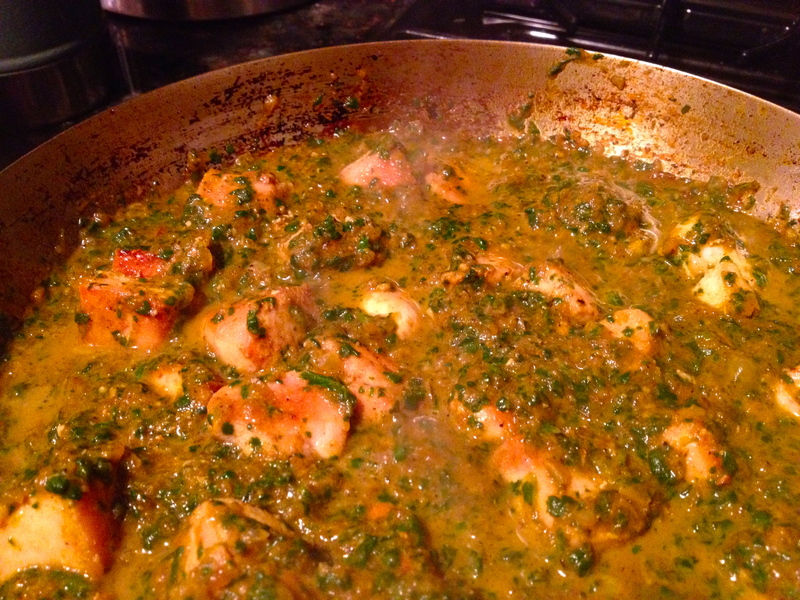 Everest favorites: chicken tikka masala, keema mutter, garlic naan, and this recipe, chicken saag. The sauce is really interesting, and I always wondered how they made it so good and creamy. Now, having gone through the process of making it, I finally understand! 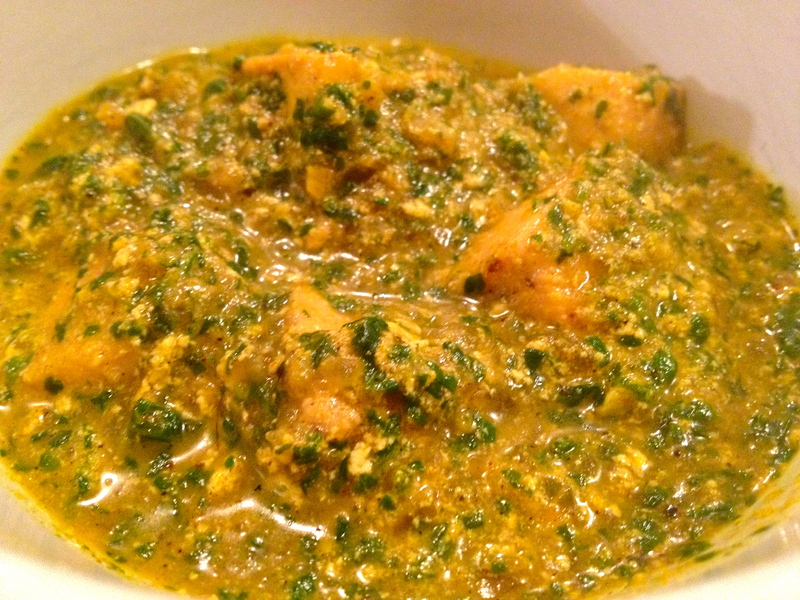 This sauce has three components: spinach, which makes it green and gives it the “saag” part of its name; yogurt, of course, a quintessential part of all the best Indian sauces; and a spiced onion mixture, which gives the dish a lot of its flavor. While I love it with chicken, this sauce is also great with vegetables or with paneer. Highly recommended for those who are new to Indian food, too – you’ll be able to handle the flavor and the spice. Mmmm. First, brown the chicken in oil or butter with some salt and pepper. Set aside. Then, over medium heat, add a bit more oil to the pan and stir in the cumin, garlic, and ginger, and cook for about 2 minutes, careful not to burn. Stir in paprika, turmeric, coriander, and the onion. Cook until soft and translucent. Add the water or stock and simmer, uncovered. 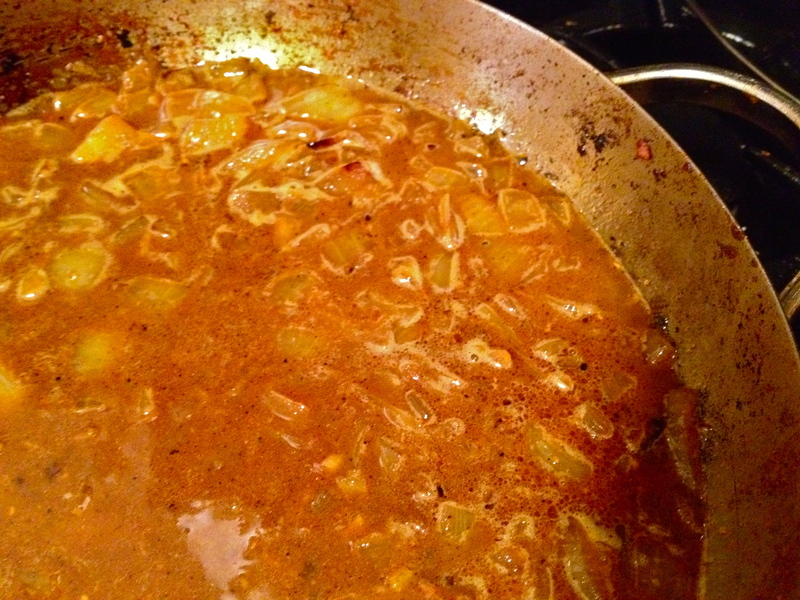 Allow the onion mixture to reduce, depending on the consistency of sauce you want (more/less liquid-y). Meanwhile, put the fresh spinach in a colander and pour a kettle of boiling water over it, to wilt it. Then squeeze out as much of the water as you can. Set aside. When the onion sauce is reduced, put it into a food processor with the spinach and blend until you’ve got a smooth, green-brown sauce. 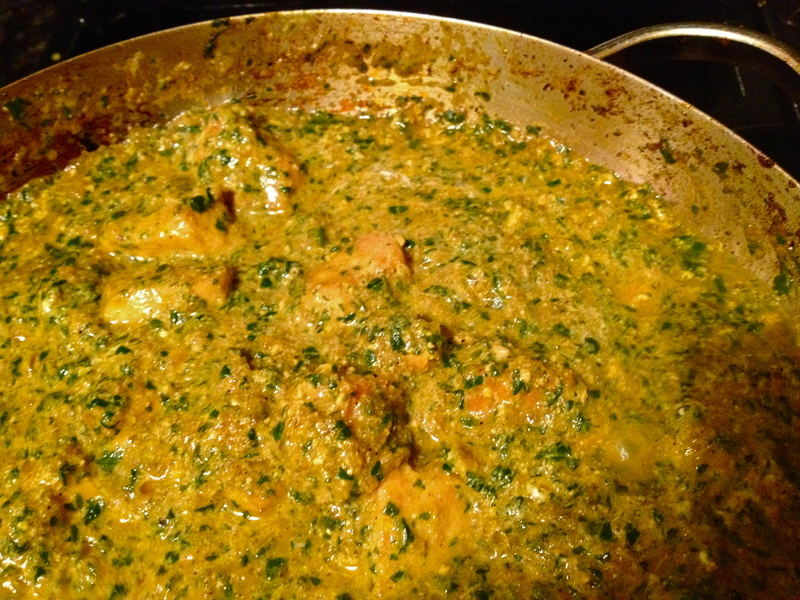 Put it back into the pan, add the garam masala, and heat to a simmer. Add the chicken back to the simmering sauce and cook, uncovered, for 15 minutes, until the chicken is cooked through. Remove from heat and stir in the yogurt, if you’re using it. Serve with garlic naan like these, which are totally fantastic, and vegetable biryani, which I’m thinking I’ll have to post a recipe on later. Yum! Enjoy! Previous Pea and Asparagus Risotto.